The sad news has broken inside the last few hours of the death of John Morrison, the big-hearted coach of the Mayo senior team in 2006 when, with Mickey Moran as manager, we reached the All-Ireland final. The widely-travelled Armagh man, who in a long sporting career managed and coached several teams in a number of different counties, was a popular figure during his short time with us. His larger than life presence, his innovative approach to coaching and his tendency for memorable quotes – remember when he said we were like Brazil? – made him a man to whom people instinctively warmed. His passing will be greeted with sadness by those within the county who knew him, as well as by the wider GAA community, in which he was so involved and to which he devoted such enormous service over many long years. May he rest in peace. 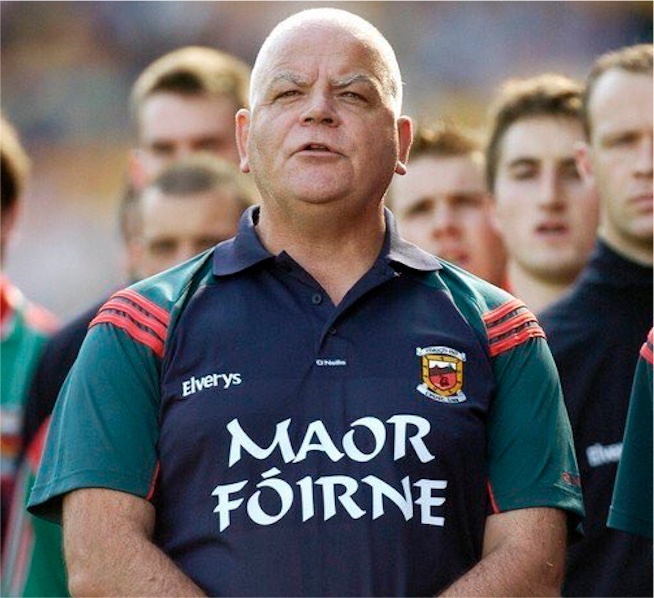 Sad news regarding John Morrison, ‘Larger than Life’ would describe John… I remember talking to him in Ballyvary when Mayo trained there, as they used to in 2006, open training sessions, all types of strange game’s played by the Mayo panelists trying to get on the starting 15, coming from the creative mind of John Morrison……His engagement with the many fan’s who would turn up for Mayo training was a joy to behold.. I don’t know who the many fan’s who kept turning up for these training sessions wanted to see the most, Ciaran Mac or John Morrison, They may have came in the first instance to see Ciaran Mac, but kept turning time and time again to see and experience what the unique John Morrison brought to the table. Certainly Mayo fans have every reason to remember John with great affection! RIP. Rip John … One of the great coaches . Brought a whole new meaning to ” coaching ” . RIP John. Took us to an All Ireland final in 2006. I can still see the cowardly shoulder into the back by Pillar Caffrey in the semi final. Childish and idiotic by the Dublin manager. John M’s reaction was class. Just stared him. It was at that point I knew that the dubs were already beat that day. RIP John. I never met the man but only heard good things. That Mayo v Dublin semi in 2006 is forever etched in my memory. Yes that shoulder in the back from Caffrey was typical of the dubs of that era. Not exactly a pillar of a man !! Rip. moran and morrison put everything into Mayo football i their short time in charge. Just a shame they were treated so badly by the county board and sacked for the return of the great John o mahoney. We all know how that venture ended. A great memory is the cowardly shoulder he took into the back by Garda Cafferey in the 2006 semi final. He may as well have been running into a brick wall. John was a fantastic guy. That win v Dublin was one of the great days we ever had and i remember bouncing into work the next day up here having beaten them. They were gutted and actully still bitter about it to this day. Watched hillgate and then the 2006 semi final on YouTube last week. Pillar Caffery and the running sly shoulder in to the back. It hardly budged John. Condolences to his family and to all his many friends. RIP John. If right was right we should have got to enjoy you as coach for a lot longer. Watched the 06 semi again recently and what brilliant enjoyment it brought to us Mayo fans. I remember that shoulder well…he picked the wrong man. You wont be forgotten by us Mayo fans. Condolences to all friends and family. May his gentle soul Rest In Peace. Himself and Mickey Moran put their heart and souls into Mayo football they were badly treated by the county board but still held Mayo football in great affection. Condolences to John’s family. Sad to hear. He was a good one. Sad news indeed, may he RIP. That semi final in 2006 will be etched in our minds forever, and we have John Morrison, Mickey Moran, Ciaran Mac, and all our great warriors on that fantastic team effort to thank for the most thrilling, exciting and nail biting finish I can ever remember, Wow it was unbelievable entertainment from start to finish, I can still see Super Mac waving his finger in air after sending over that glorious point from out near the sidline to win it for us, Priceless and enshrined in the memory bank forever. Rip John and condolences to his family and friends. I really enjoyed Mickey Moran and John tenure as the Mayo management at that time. They brought great enthusiasm and passion to their role which in turn the players brought onto the pitch as a result. The ultimate game that highlighted this was that a all Ireland semi again Dublin in 06. We played with guts. determination and loads of skill. And also stood up physically to the dubs especially David Brady when he put Whelan into his pocket when he came on. I was beside mc in the upper hogan when he hit that beautiful winning point. To this I still think I floated down onto jones rd after that match. Bar beating Tyrone in 89 it’s the best day I have had in croke park supporting Mayo. Thanks for the great memories John . The gaa’s loss is heavens gain. Ar dheis De go raibh a anam dills! Yes, Bohola, remember the pre-match stuff as much as the match itself. I still smile when I see Pillar’s shoulder on John. There has never been anything quite like that match. Even though I was at the canal end of the Hogan, with a bad view of the Hill, the place erupted when Mayo took over the Hill; you could feel 84,000 shouts, screams, and gestures as the ‘warm-up’ proceeded. Jesus, when I think of the so-called supporters at rugby internationals who wander in after the kick off (and as for half-time), I have to laugh. RIP John, and sympathies to his family and friends. I would be hard pushed to remember another day of 2006 but can recall vividly where I sat for that semi, who was beside me, the blow by blow before the throw in and obviously the mighty comeback. I think it sums up our lives really and for John, to be a part of such a happy memory is a truly fine legacy. I was in the Hogan – in a box, no less (I had to pull all the strings to get in that day) – almost directly behind where Ciaran Mac shot for the winning point in ’06. As long as I live, I’ll never forget that moment nor that whole day. Just checking the archives on the teams. Both keepers still playing – Cluxton and Clarke. Plus Keith and Andy ‘ I will get you a goal’ Moran. My God, what legends one and all, including our nemesis, who really is a legend! The Son and I watched the full 2006 match and the build-up on Youtube last night, I agree Pillar was stupid, told all his players to read the stuff that was written about them in the Newspapers, that elbow into the back was scummy, also our own Mayo man McStay throwing the ball at the back of the referees head at a game last Summer, it did’nt look good, no excuses. Maybe it is because that I look at football differently now than back in 2006, but the styles have greatly changed, in 2006 it was a kickout to midfield, 50 / 50 and the best fielder would usually catch or break the ball, the passes were quite poor and went astray very often, however back in 2006 the Mayo goalkeeper did go short and low a few times with a player collecting the ball nearly on the sideline. Keith Higgins & Andy Moran still playing ( even much better players now in 2019 than back in 2006 ). The main change from now to 2006 is Professionalism, players are fitter, stronger and more skillful. The forwards can now when there own ball ( mostly ). Some easy scores were missed by both teams back in 2006, this has changed particularly for the Dubs. I showed the Son the run that Kieran McDonald made for the winning point ( did’nt notice this during the live thriller from the awful high seat at the top of the Cusack stand ), he was on his own fifty yard line and sprinted to collect the ball from Kevin O Neill to score with the left foot on the left side of the pitch. We Mayo supporters are used to gong from the highs to the lows, the final, need I say anymore. Thanks John Morrison for being involved in that great win. I was seated in the Lower Hogan, Hill end, in an almost exclusively Dublin section. My bother and I took fierce, so called “good natured” abuse throughout the game, but God we gave it back in spades as McDonald’s point went over at the end. The shoulder in the back was typical of the particular Dublin arrogance of that time and credit to Moran and Morrison for instilling something into our players. It was “No Pasaran” that day! RIP John. The one other thing I recall about that 2006 semi was Keith Higgins’ role in the winning point. Keith was only a young buck then – captain of the U21 All-Ireland winning side that year – and he’d had a really difficult time in that game trying, mostly without success, to keep the lid on their star player Alan Brogan. But despite this, Keith had the confidence and bravery to charge upfield in that late move, taking possession at pace on their fifty and then offloading to Kevin O’Neill. You know the rest. I tried with might and mane to get a ticket for that 2006 semi-final but no joy. I was standing opposite Barry’s Hotel with about half an hour to throw-in, disconsolate. Then a Mayo man passing by with his son said “Are you looking for a ticket?” I couldn’t believe it. He led me off to meet another man God knows where, I had no idea where I was. But at the end of it, I had a ticket in my hand and raced off for Croker. That whole day will live with me forever. We were in the lower Cusack towards the Canal end, but a good view all the same. The noise was something I never experienced before (or since I think) – I could barely think in those last few frantic minutes. McDonald’s wonder kick from under the Hogan, Mark Vaughan’s free kick that Clarke punched clear from above the crossbar, Aidan Higgins amazing block of a certain point, Kevin O’Neill booting the ball off the pitch as hard as he could to run down the clock. Then the final whistle, the roar!!!! The emotion, the incredulity of what our Mayo team had done, the sheer joy on the Mayo faces, priceless memories. Hi Wille Joe, apologies haven’t posted in a while and meant to wish you and your family a happy new year and all the posters on this fantastic site, a bit late I know, but maybe for St Patrick’s day im a bit early, hahaha, Anyway im so well informed from ur expert information, facts and figures, and all the information from well informed bloggers, it’s basically all covered, Meant to post this first yesterday but got a bit of a shock when John Morrison RIP passed away, and then the memories of 06 came flooding back, and I got a bit carried away. Great to hear Tom Parsons and all the other injured players are making good progress, massive games to come, happy with everything so far, if we could put a marker down, and beat the big 2 in the league it would be like 2006 all over again, Come On Mayo. That generation of Dublin players were quite unlikeable. Roaring in opponents faces, pointing at the scoreboard, marching to the Hill like a bunch of idiots. A great GAA and indeed sports man, the conversations of what might have been and if only so and so had done this or seen him in time will only get richer in the next life with his passing. RIP John. A fantastic influence. Have enjoyed the stories and especially that semi final in 06.Unbelievable team work that day especially in the last 10 minutes…They believed!